Today DC Sports Bog's Dan Steinberg throws on his reporter's fedora and gets to the bottom of the logistical change, including the new challenges for the dislocated broadcasters, and the precise dollar figure on why the Wizards made the move. It's part of a league-wide trend, and the Wizards won't be the last to do it—most NBA teams have already bumped their radio crews upstairs—but as of this season, only Washington and Philadelphia have no broadcasters in either the first or second row. It's no secret that money's behind it. By replacing the radio and TV tables with seating, the Wizards were able to create 16 "Owner's Club" seats, at $1,500 a pop. Despite the team's problems with attendance, all the seats have been sold for this season, bringing the total to around $1 million. 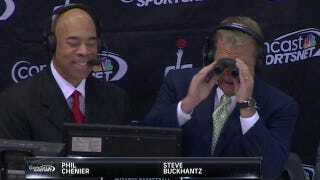 When both CSN's Steve Buckhantz and Fox Sports Detroit's George Blaha were fooled by Trevor Ariza's buzzer-beating attempt that fell well short, it was a function of distance. "If I'm sitting in my old seat, there's not a tenth of a percent chance I miss that call," Buckhantz said. "From that particular perspective the ball looked like it went in. I've watched it 100 times, and each time it went in. I would make the same call each time." "It's not breaking news that that is not a good vantage point," agreed Blaha, who lauded the work done by Wizards senior director of communications Scott Hall and his assistants. "If you didn't have the best statisticians in the league and a great media relations group, it would be extremely difficult. They make it as easy as possible. But you really have a problem with depth perception there." As teams chase the profits of premium seating, it's not just fans priced out of attending games who suffer. Wizards TV viewers, and soon enough the rest of us, lose our conduit to the action—we rely on broadcasters, feet from the floor, to note things the cameras can't capture. As far as owners are concerned, your understanding of the game is a small price to pay for an extra $24,000 a night.